"The Baltimore Bullet"; "Flying Fish"
Michael Fred Phelps II (born June 30, 1985) is an American competition swimmer and the most decorated Olympian of all time, with a total of 22 medals. Phelps also holds the all-time records for Olympic gold medals (18, double the second highest record holders), Olympic gold medals in individual events (11), and Olympic medals in individual events for a male (13). In winning eight gold medals at the 2008 Beijing Games, Phelps took the record for the most first-place finishes at any single Olympic Games. Five of those victories were in individual events, tying the single Games record. In the 2012 Summer Olympics in London, Phelps won four golds and two silver medals, making him the most successful athlete of the Games for the third Olympics in a row. After the 2008 Summer Olympics, Phelps started the Michael Phelps Foundation, which focuses on growing the sport of swimming and promoting healthier lifestyles. He continues to work with his foundation after the 2012 Olympics, which he has said will be his last. In April 2014, Phelps announced he would come out of retirement, and would enter an event later that month. Phelps was born and raised in the Dumbarton Middle School, and Towson High School. Michael is the youngest of three children. His mother, Deborah Sue "Debbie" (née Davisson), is a middle school principal. His father, Michael Fred Phelps, is a retired Maryland state trooper who played football in high school and college and tried out for the Washington Redskins in the 1970s. Phelps's parents divorced in 1994, and his father remarried in 2000. His ancestry includes English, Irish, Scottish, Welsh, and German. 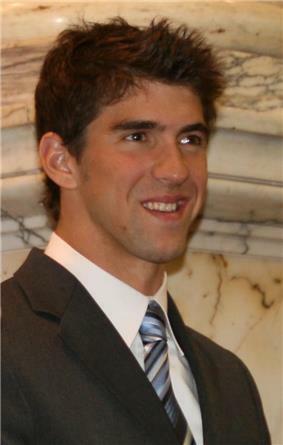 Phelps graduated from Towson High School in 2003. Phelps began swimming at the age of seven, partly because of the influence of his sisters and partly to provide him with an outlet for his energy. When Phelps was in the sixth grade, he was diagnosed with attention deficit hyperactivity disorder (ADHD). By the age of 10, he held a national record for his age group, and Phelps began to train at the North Baltimore Aquatic Club under coach Bob Bowman. More age group records followed, and Phelps's rapid improvement culminated in his qualifying for the 2000 Summer Olympics at the age of 15 and becoming the youngest male to make a U.S. Olympic swim team in 68 years. While he did not win a medal, he did make the finals and finished fifth in the 200-meter butterfly. At the World Championship Trials for the 2001 World Aquatics Championships, on March 30, Phelps broke the world record in the 200-meter butterfly to become, at 15 years and 9 months, the youngest man ever to set a swimming world record. Previously this was Ian Thorpe, who lowered the 400-meter freestyle world record at 16 years, 10 months. At the World Championships in Fukuoka, Japan, Phelps broke his own world record in the 200-meter butterfly en route to becoming a world champion for the first time. At Nationals, the selection meet for the 2002 Pan Pacific Swimming Championships, in Fort Lauderdale, Florida, Phelps set an American record in the 200-meter individual medley and was just off the world record in the 200-meter butterfly. In the 400-meter individual medley, Phelps bettered the world record held by Tom Dolan with a time of 4:11.09, just ahead of Erik Vendt, who finished second with a time of 4:11.27, also below the old world record. In the 200-meter freestyle, Phelps was barely beaten by Klete Keller and in the 100-meter butterfly, Phelps beat Ian Crocker. At the 2002 Pan Pacific Swimming Championships in Yokohama, Japan, Phelps won three gold medals and two silvers. In his first event, the 400-meter individual medley, Phelps won gold ahead of Erik Vendt with a time of 4:12.48. In the 200-meter butterfly, Phelps lost to Tom Malchow, finishing behind him 1:55.41 to 1:55.21. Phelps said he lost because he did not take butterfly training seriously after he broke the world record. In the 200-meter individual medley, Phelps won with a time of 1:59.70. In the 4×200-meter freestyle relay, Phelps, along with Nate Dusing, Klete Keller, and Chad Carvin, won the silver medal with a time 7:11.81 finishing behind Australia. 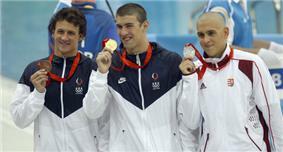 The U.S. 4×100-meter medley relay team consisted of Aaron Peirsol, Brendan Hansen, Phelps, and Ian Crocker. In the final for the medley relay, Phelps swam a 51.1 split, at the time the fastest split in history. The final time of 3:33.48 was a world record. At Nationals, Phelps won the 200-meter freestyle, 200-meter backstroke, and the 100-meter butterfly. He became the first American swimmer to win three different races in three different strokes at a national championship. At the 2003 Duel in the Pool, a meet that pits swimming stars from Australia and the United States, Phelps broke the world record in the 400-meter individual medley with a time of 4:10.73 and almost broke the world record in the 100-meter butterfly, just missing the record by 0.03 seconds. At a meet in Santa Clara County, California, Phelps broke the world record in the 200-meter individual medley with a time of 1:57.94. Phelps said he broke the 200-meter individual medley world record after Don Talbot said Phelps was unproven, using his words as motivation. At the 2003 World Aquatics Championships, Phelps won four gold medals, two silver medals, and broke five world records. Phelps broke his first world record on July 22 in the semi-finals for the 200-meter butterfly. Phelps swam a 1:53.93 to break his own world record of 1:54.58 set in 2001 and became the first man to swim under 1:54.00. In the final of the 200-meter butterfly, on July 23, Phelps easily won the gold medal, but did not come close to his world record with a time of 1:54.35. Less than an hour later, Phelps swam the lead-off leg for the 4×200-meter freestyle relay. Phelps put up a solid time of 1:46.60 (an American record) but the Americans could not match the depth of the Australians and ultimately finished second 7:10.26 to 7:08.58. In the 200-meter individual medley, Phelps dominated. On July 24, in the semifinals of the 200-meter individual medley, he broke his own world record with a time of 1:57.52. On July 25, in the final of the 200-meter individual medley, Phelps smashed his own record with a time of 1:56.04 to win the gold medal and finished almost 3 seconds ahead of Ian Thorpe. About an hour before the final of the 200-meter individual medley, Phelps swam in the semifinals of the 100-meter butterfly. Phelps dominated again, finishing in the top seed position with a world record time of 51.47. However, in the final of the 100-meter butterfly, on July 26, Ian Crocker erased Phelps's world record with a time of 50.98, to become the first man under 51 seconds. Phelps swam a 51.10 (also under his former world record), but had to settle for silver. In the final of the 400-meter individual medley, on July 27, Phelps broke his own world record with a time of 4:09.09 to easily claim the gold medal. About half an hour later, Phelps earned his final gold medal when the United States team won the 4×100-meter medley relay. Phelps did not swim in the finals, but still earned a medal because he swam in the heats. At the 2004 U.S. Olympic Team Trials, Phelps competed in six events; the 200- and 400-medley individual medley, the 100- and 200-meter butterfly, the 200-meter freestyle, and the 200-meter backstroke. In his first event, the 400-meter individual medley, Phelps easily won with a world record time of 4:08.41. Two days later, in the 200-meter freestyle, Phelps won with a time of 1:46.27, finishing sixth-tenths of a second ahead of Klete Keller. Phelps, however, was not pleased with the result and wanted to be in the 1:45s and was uncertain if he would swim the event in Athens. The following day, Phelps won in the 200-meter butterfly with a time of 1:54.31, three seconds ahead of second-place finisher Tom Malchow. After two days off, Phelps was back in the pool and finished second to Aaron Peirsol in the 200-meter backstroke. 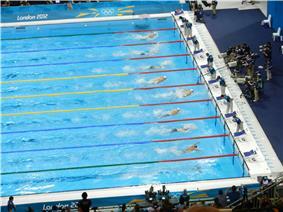 Less than half an hour later, Phelps won the 200-meter individual medley title ahead of Ryan Lochte by 2.70 seconds. The following day, Phelps finished second to Ian Crocker in the 100-meter butterfly. Crocker won in a time of 50.76, a world record and 0.39 seconds ahead of Phelps. When the Trials were over, Phelps became the first person to qualify in six individual events for a U.S. Olympic team. However, Phelps dropped the 200-meter backstroke to focus on the 200-meter freestyle because he wanted to race Ian Thorpe. Even though Phelps didn't compete in the 100-meter freestyle at the Trials, he was still selected for the 4×100-meter freestyle relay. Gary Hall, Jr. thought this was unfair and said Phelps did not deserve a spot on the relay. Phelps argued his program was too crowded to compete in 100-meter freestyle and was at least among the top four swimmers because he had beaten the top-seeded Jason Lezak the last time he had swum against him. In his first event, the 400-meter individual medley, Phelps won with a world record time of 4:08.26 to win his first Olympic gold medal. The following day, in the 4×100-meter freestyle relay, Phelps, along with Ian Crocker, Neil Walker, and Jason Lezak, finished in third place with a time of 3:14.62. Crocker's lead-off time of 50.05 was the worst among the field and was blamed on sickness. In the event many were calling The Race of the Century, held the following day, Phelps finished in third place behind Ian Thorpe and Pieter van den Hoogenband in the 200-meter freestyle. Although this race ended the chance to match Spitz's record, Phelps had savored the challenge even though it was not his strongest event, saying "How can I be disappointed? I swam in a field with the two fastest freestylers of all time". In his fourth event, the 200-meter butterfly, held the following day, Phelps finished first with a time of 1:54.04, breaking Tom Malchow's Olympic record. About an hour later, in the 4×200-meter freestyle relay, Phelps, along with Ryan Lochte, Peter Vanderkaay, and Klete Keller, finished in first place with a time of 7:07.33. Two days later, in the 200-meter individual medley, Phelps finished first with a time of 1:57.14, an Olympic record. In the 100-meter butterfly final, held the following day, Phelps defeated American teammate Ian Crocker (who held the world record in the event at the time) by just 0.04 seconds with a time of 51.25. Traditionally, the American who places highest in an individual event will be automatically given the corresponding leg in the 4×100-meter medley relay final. This gave Phelps an automatic entry into the medley relay, but he deferred and Crocker swam instead. Phelps's gesture gave Crocker a chance to make amends as well getting his final shot at a gold medal. The American medley team went on to win the event in world-record time, and, since Phelps had raced in a preliminary heat of the medley relay, he was also awarded a gold medal along with the team members who competed in the final. In winning six gold and two bronze medals, Phelps, still a teenager, had the second-best performance ever at a single Olympics, behind Mark Spitz's seven gold medals at the 1972 Summer Olympics. Also, he became the second male swimmer ever to win more than two individual titles at a single Games with four, tying Spitz's four from 1972. Victory lap of the 100 m butterfly during the 2005 FINA World Championships in Montréal. Phelps is far right. At the 2005 World Championship Trials, Phelps decided to drop his specialty events, the 400-meter individual medley and the 200-meter butterfly, and experiment with the 400-meter freestyle and the 100-meter freestyle. Phelps went on to win the 400-meter freestyle, the 200-meter freestyle, the 100-meter butterfly, the 100-meter freestyle, and the 200-meter individual medley at the Trials. At the 2005 World Aquatics Championships, Phelps won a total of six medals, 5 golds and one silver. In the 400-meter freestyle, Phelps did not make it past the preliminary heats and finished 18th overall with a time of 3:50.53. Later that day, in the 4×100-meter freestyle relay, Phelps won his first gold in the Championships. Two days later, on July 26, Phelps won his second gold in the 200-meter freestyle with a new American record time of 1:45.20, finishing ahead of Grant Hackett. Two days later, on July 28, Phelps finished seventh in the 100-meter freestyle final. Later that day, Phelps won his third gold in the 200-meter individual medley. On July 29, Phelps, along with Ryan Lochte, Peter Vanderkaay and Klete Keller, won the gold in the 4×200-meter freestyle relay with a time of 7:06.58. This was the fourth gold medal for Phelps. On July 30, Phelps swam in his last individual event, the 100-meter butterfly. In the final, Phelps could not match the speed of Ian Crocker and had to settle for silver, finishing 51.65 to 50.40. On July 31, Phelps earned his final gold medal when the United States team won the 4×100-meter medley relay. Phelps did not swim in the finals but still earned a medal because he swam in the heats. At the 2006 National Championships, Phelps won a total of three events. In his first event, the 200-meter butterfly, Phelps won with a time of 1:54.32. In his second event, the 100-meter butterfly, Phelps just edged out Ian Crocker 51.51 to 51.73. In his third event, the 200-meter individual medley, Phelps won with a time of 1:56.50, just ahead of Ryan Lochte's time of 1:56.78. At the 2006 Pan Pacific Swimming Championships in Victoria, British Columbia, Phelps won five gold medals and one silver. In his first event, the 200-meter butterfly, Phelps won in a world record time of 1:53.80, his first world record in two years. In his second event, the 400-meter individual medley, Phelps easily won with a time of 4:10.47, 3.38 seconds ahead of second-place finisher Robert Margalis. In his third event, the 4×200-meter freestyle relay, Phelps, along with Ryan Lochte, Peter Vanderkaay, and Klete Keller, won the gold medal with a time of 7:05.28. In his fourth event, the 200-meter backstroke, Phelps won the silver medal, finishing behind Aaron Peirsol 1:56.81 to 1:54.44. In his fifth event, the 4×100-meter freestyle relay, Phelps, along with Neil Walker, Cullen Jones, and Jason Lezak, won the gold medal with a world-record time 3:12.46. In his sixth event, the 200-meter individual medley, Phelps won with a world record time of 1:55.84, breaking his record of 1:55.94 set in 2003. At the 2007 World Aquatics Championships, Phelps won seven gold medals, tying the record, and broke five world records. Phelps first gold medal came in the 4×100-meter freestyle. Phelps swam the lead-off leg in 48.42 seconds and Neil Walker, Cullen Jones and Jason Lezak each expanded the lead to win in a Championship record of 3:12.72, just missing the world record of 3:12.46 set the previous year. His lead-off time was faster than the winning time in the individual 100-meter freestyle final later in the meet. Phelps set his first world record in the Championships in the 200-meter freestyle, his second race. Phelps won the gold ahead of Pieter van den Hoogenband and broke Ian Thorpe's six-year-old world record with a time of 1:43.86. For his third race, the 200-meter butterfly, Phelps won the gold and bettered his own world record of 1:53.71 with a time of 1:52.09. For his fourth race, the 200-meter individual medley, Phelps set his third world record with a time of 1:54.98, bettering his own world-record time of 1:55.84 For his fifth race, the 4×200-meter freestyle relay, Phelps swam the lead-off leg in 1:45.36 as the American team of Ryan Lochte, Klete Keller, and Peter Vanderkaay went on to win the gold medal and beat the previous world record set by Australia in 2001 with a time 7:03.24. For his sixth race, the 100-meter butterfly, Phelps edged out Ian Crocker 50.77 to 50.82 to win his sixth gold medal. For his seventh event, the 400-meter individual medley, Phelps won the gold medal in a world-record time of 4:06.22, more than 3.5 seconds ahead of Ryan Lochte. By winning seven gold medals, Phelps broke the record of six set by Ian Thorpe at the 2001 World Championships. The 4×100-meter medley relay team would have competed in the final, but received a disqualification for a false start during a changeover in the heats, ending Phelps's chance of eight gold medals. Even though Phelps competed in the backstroke in international competition only once (at the 2006 Pan Pacific Championships), he was among the best backstroke swimmers in the world. This is illustrated by his personal best times set in 2007, four months after the World Championships. At the US Nationals in Indianapolis on August 1, 2007, Phelps swam a 1:54.65 in the 200-meter backstroke, which was the third fastest of all time in the event, 0.33 of a second off the world record of 1:54.32 held by Ryan Lochte. Two days later Phelps swam a time of 53.01 sec in the 100-meter backstroke, 0.03 of a second short of the world record of 52.98 held by Aaron Peirsol and the second-fastest performance of all time. In 2007 Phelps swam into the all-time top 3 performances in seven individual events, four of these being world records. At the 2008 U.S. Olympic Team Trials, Phelps competed in six individual events. In his first event, the 400-meter individual medley, Phelps broke his own world record of 4:06.22 with a time of 4:05.25. In his second event, the 200-meter freestyle, Phelps won with a time of 1:44.10, ahead of Peter Vanderkaay's time 1:45.85. In his third event, the 100-meter freestyle, Phelps placed second in his heat with a time of 47.92, ensuring him a spot on the relay. In his fourth event, the 200-meter butterfly, Phelps won with a time of 1:52.20. In his fifth event, the 200-meter individual medley, Phelps broke his own world record of 1:54.98 with a time of 1:54.80. In his sixth and final event, the 100-meter butterfly, Phelps won with a time of 50.89. When asked about his chances of winning eight gold medals in Beijing, Phelps said, "I am going to prepare for that meet just like I do every other meet ... There is only so much I can do in a month and then I am going to prepare myself the best that I can." Phelps set an Olympic record in the preliminary heats of the 400-meter individual medley. He followed that up in the final by winning the gold medal, as well as breaking his previous world record by nearly two seconds. Phelps swam the first leg of the 4×100-meter freestyle relay in a time of 47.51 seconds (an American record for the 100-meter freestyle), and won his second gold medal of the 2008 Olympics, as well as setting his second world record of the Olympics (3:08.24). Teammate Jason Lezak, after beginning the anchor leg more than half a body length behind Alain Bernard, managed to finish ahead of the second-place French team by eight hundredths of a second. The top five teams in the final finished ahead of the world record of 3:12.23 set the previous day by the American B team in a preliminary heat. For his third race, Phelps broke his previous world record in the 200-meter freestyle by nearly a second and won his third gold medal. He also set his third world record at the Olympics, 1:42.96, winning by nearly two seconds over silver medalist Park Tae-Hwan. In this race, Phelps became only the fifth Olympic athlete in modern history to win nine gold medals, joining Mark Spitz, Larisa Latynina, Paavo Nurmi, and Carl Lewis. The next day, Phelps participated in two finals. In his first event, the 200-meter butterfly, Phelps made it four gold medals and world records in four events by swimming the final in 1:52.03, defeating silver medalist László Cseh by almost seven-tenths of a second despite his goggles' having filled up with water and being unable to "see anything for the last 100 meters. This fourth gold medal was his tenth, and made him the all-time leader for most Olympic gold medals won by an individual in the modern Olympic era. Moreover, Phelps became the first swimmer, male or female, to win three Olympic butterfly titles, after his two titles in the Athens 2004 Olympics. He also became the first swimmer to successfully defend an Olympic butterfly title. Less than one hour after his gold medal victory in the 200-meter butterfly, Phelps swam the lead-off leg of the 4×200-meter freestyle relay. With Lochte, Ricky Berens, and Peter Vanderkaay, he won his fifth gold and set his fifth world record as the American team finished first with a time of 6:58.56. The Americans were the first team to break the seven-minute mark in the relay, and broke the previous record, set in Melbourne, Australia, by more than four and a half seconds. After taking a day off from finals (Phelps did swim in qualifying heats), Phelps won his sixth gold of the Beijing Games on August 15 by winning the 200-meter individual medley with a world record time of 1:54.23, finishing ahead of Cseh by over two seconds. Before the final of the 100-meter butterfly, US born Serbian swimmer Milorad Čavić caused a minor stir when he said it would be "good" if Phelps lost. "It'd be good for him if he loses. It would be nice if historians talk about Michael Phelps winning seven gold medals and losing the eighth to 'some guy.' I'd like to be that guy", Čavić said. Phelps responded, "When people say things like that, it fires me up more than anything." On August 16, Phelps won his seventh gold medal of the Games in the men's 100-meter butterfly, setting an Olympic record for the event with a time of 50.58 seconds and edging out his nearest competitor Čavić, by one hundredth (0.01) of a second. Unlike all six of his previous events in the 2008 Games, Phelps did not set a new world record, leaving intact Ian Crocker's world-record time of 50.40 seconds, set in 2005. Phelps's 0.01-second finish ahead of Čavić prompted the Serbian delegation to file a protest. Subsequent analysis of the video by the FINA panel, which required analyzing frames shot 1/10,000th of a second apart, was used to officially confirm Phelps's victory, but the images were not immediately released to the press. The initial refusal by official timekeeper Omega to release underwater photos of the finish also raised questions due to Phelps's sponsorship relationship with Omega. Čavić later wrote in his blog, "People, this is the greatest moment of my life. If you ask me, it should be accepted and we should move on. I've accepted defeat, and there's nothing wrong with losing to the greatest swimmer there has ever been." In April 2015 Spitz said he had been sent an email posted by Omega that had said Phelps had lost the 100m butterfly final. Phelps's seventh gold medal of the Games tied Mark Spitz's record for gold medals won in a single Olympic Games, set in the 1972 Olympics. It was also his fifth individual gold medal in Beijing, tying the record for individual gold medals at a single Games originally set by Eric Heiden in the 1980 Winter Olympics and equaled by Vitaly Scherbo at the 1992 Summer Games. Said Phelps upon setting his seventh-straight Olympic record of the Games in as many events, "Dream as big as you can dream, and anything is possible ... I am sort of in a dream world. Sometimes I have to pinch myself to make sure it is real." Michael Phelps celebrates with his teammates after winning his 8th gold medal. On August 17, Phelps won his eighth gold medal in the 4×100-meter medley relay, breaking Mark Spitz's record of seven gold medals won in a single Olympic Games, which had stood since 1972. Phelps, along with teammates Brendan Hansen, Aaron Peirsol, and Jason Lezak, set a new world record in the event with a time of 3 minutes and 29.34 seconds, 0.7 seconds ahead of second-place Australia and 1.34 seconds faster than the previous record set by the United States at the 2004 Olympic Games in Athens. When Phelps dived in to swim the 100-meter butterfly leg, the third leg of the 400-meter medley, the United States had been trailing Australia and Japan. Phelps completed his split in 50.1 seconds, the fastest butterfly split ever for the event, giving teammate Jason Lezak a more than half-second lead for the final leg, which he held onto to clinch the event in world record time. Said Phelps, upon completing the event that awarded him his eighth gold medal and eighth Olympic record in as many events, "Records are always made to be broken no matter what they are ... Anybody can do anything that they set their mind to." At the 2009 National Championships, Phelps drastically shortened his program, swimming in only three individual events. In his first event, the 200-meter freestyle, Phelps won with a time of 1:44.23. In his second event, the 200-meter butterfly, Phelps easily won with a time of 1:52.76, 0.88 seconds ahead of the second-place finisher. In his third event, the 100-meter butterfly, Phelps won with a world-record time of 50.22. Phelps (center) before the start of the 200-meter butterfly semifinal during 2009 FINA World Championships. At the 2009 World Aquatics Championships, Phelps won a total of 6 medals, 5 golds and 1 silver. In his first event, the 4×100-meter freestyle relay, Phelps swam the lead-off leg in 47.78, well off his 47.51 performance in Beijing, but the American team was able to edge out Russia and France for the gold. For his second race, the 200-meter freestyle, Phelps lost his first race in four years to Germany's Paul Biedermann. Phelps touched second in 1:43.22, but Biedermann smashed Phelps's record of 1:42.96 set in Beijing a year ago with a time of 1:42.00. Phelps took the silver graciously, but coach Bob Bowman threatened to withdraw Phelps from international competition because Bowman claimed Biedermann had an unfair advantage because he was wearing a full polyurethane swimsuit, specifically an Arena X-Glide. Bowman said, "It took me five years to get Michael from 1:46 to 1:42 and this guy has done it in 11 months. That's an amazing training performance. I'd like to know how to do that." Phelps rebounded from this loss and for his third race, the 200-meter butterfly, Phelps won the gold and broke his own world record of 1:52.03 with a time of 1:51.51. For his fourth race, the 4×200-meter freestyle relay, Phelps swam the lead-off leg in 1:44.49 as the team went on to win the gold medal and break the world record set the previous year. After his loss in the 200-meter freestyle, many thought Phelps was vulnerable coming into the final for the 100-meter butterfly. His closest competitor, Milorad Čavić, who wore an Arena X-Glide (the same suit Biedermann beat Phelps with), thought people were making excuses for Phelps because he was wearing an LZR Racer. Čavić even offered to buy Phelps a new suit. For his fifth race, the 100-meter butterfly, Phelps won the gold and became the first man to complete it in under 50 seconds, beating Čavić 49.82 to 49.95. The victory prompted a fierce celebration from Phelps, who sat on the lane rope and pumped his chest and swimsuit. For his final event, the 4×100-meter medley relay, Phelps won his fifth gold medal. Phelps, along with teammates Aaron Peirsol, Eric Shanteau, and David Walters, set a new world record in the event with a time of 3 minutes and 27.28 seconds. At the 2010 National Championships, Phelps competed in five individual events. In the 200-meter freestyle, Phelps won ahead of Ryan Lochte in a time of 1:45.61. About an hour later, Phelps returned to the pool to win the 200-meter butterfly. But Phelps was not happy with his performance and called it the "worst" 200-meter butterfly of his life. In the 100-meter butterfly, Phelps won his 50th national title in 50.65. After the race, Phelps said he was "fairly pleased" with the result. In the 200-meter individual medley, Phelps finished second to Lochte 1:55.94 to 1:54.84. It was the first time Lochte had beat Phelps in a major national meet. In the 200-meter backstroke, Phelps finished in 4th place in 1:56.98. On the first day of competition at the 2010 Pan Pacific Swimming Championships, Phelps opted out swimming in the final of the 200-meter freestyle to focus on the 200-meter butterfly. In the 200-meter butterfly, Phelps led from start to finish, coming in first with a time of 1:54.11. Although it was much slower than his 1:51.51 time from the previous year, Phelps had not lost a 200-meter butterfly final since 2002. On day two of the competition, Phelps swam in the heats of the 400-meter individual medley and contributed in the 4×200-meter freestyle relay. In the heats of the 400-meter individual medley, Phelps failed to make the A final, with Lochte and Tyler Clary taking the top two American positions. Phelps did not swim in the B final of the 400-meter individual medley. In the 4×200-meter freestyle relay, Phelps, with Peter Vanderkaay, Ricky Berens, and Lochte, finished first ahead of Japan and Australia. On day three of the competition, Phelps competed in the 100-meter butterfly and contributed in the 4×100-meter freestyle relay. In the 100-meter butterfly, Phelps finished first in a time of 50.86, a championship record. In the 4×100-meter freestyle relay, Phelps, with Lochte, Jason Lezak, and Nathan Adrian, finished first ahead of Australia and South Africa. As the lead-off leg in the 4×100-meter freestyle relay, Phelps set the championship record in the 100-meter freestyle with a time of 48.13. In his final event, Phelps swam in the 4×100-meter medley relay with Aaron Peirsol, Mark Gangloff, and Adrian and finished first ahead of Japan and Australia. In his first event at the 2011 World Aquatics Championships in Shanghai, Phelps won bronze in the 4×100-meter freestyle relay with Garrett Weber-Gale, Jason Lezak, and Nathan Adrian. This was Phelps's first bronze in a World Aquatics Championships. Phelps swam the lead-off leg in 48.08, the second-best lead-off in the field behind James Magnussen's 47.49. In his second event, the 200-meter freestyle, Phelps won silver for the second consecutive time at a World Aquatics Championships. This time he finished second to Ryan Lochte in the event with a time of 1:44.79, compared to Lochte's time of 1:44.44. In his third final, the 200-meter butterfly, he won his first gold medal with a time of 1:53.34 to become the first swimmer to win five gold medals in one discipline at the World Aquatics Championships. In his fourth event, the 200-meter individual medley, Phelps again finished second to Lochte in a personal best of 1:54.16, which was 0.16 behind Lochte who swam a new world record. It was Phelps's 30th medal in the World Aquatics Championships. Shortly after completing the semifinals of the 100-meter butterfly, Phelps competed in the 4×200-meter freestyle relay with Peter Vanderkaay, Ricky Berens, and Ryan Lochte. Phelps's team won the gold medal in a time of 7:02.67. Phelps swam the lead-off leg in 1:45.53, the third-best leg in the field. In the 100-meter butterfly, Phelps won his third consecutive title (also winning in 2007 and 2009) and second individual title of the meet with a time of 50.71. In his last event, the 4×100-meter medley relay, Phelps teamed with Nick Thoman, Mark Gangloff, and Nathan Adrian to win gold in a time of 3:32.06. Phelps's butterfly leg of 50.57 was by far the fastest butterfly leg in the field. For the 2012 Summer Olympics in London, Phelps originally stated he would never do eight events again, and would instead try new events. Phelps said, "I keep saying I want to go down and start sprinting, but Bob [Bowman, Phelps's coach] really isn't so keen on that ... I don't think that's going to happen ... Over the next four years, I'd like to try some different events, maybe not do some of the events I did here." However, at the 2012 United States Olympic Trials, the qualifying meet for the 2012 Summer Olympics, Phelps qualified in the same eight events that he swam in Beijing in 2008. He later dropped the 200-meter freestyle from his program, as he stated he wanted to focus on the 4×100-meter freestyle relay. During the trials, Phelps finished first in the 200-meter freestyle, 100-meter butterfly, 200-meter butterfly, 200-meter individual medley, and second in the 400-meter individual medley. In making his fourth Olympic team, Phelps holds the record for men for the most Olympic appearances in swimming representing the United States. On July 28, 2012, Phelps placed eighth in the morning prelims. Phelps, the two-time defending Olympic champion, won his 400 individual medley heat in 4 minutes, 13.33 seconds with a time that was well off his world record of 4:03.84 set four years ago in Beijing, when Phelps won a record eight gold medals. He out touched László Cseh by 0.07 seconds in his heat to qualify last for the final, locking out Cseh. In his first finals of the Summer Olympics, Phelps placed fourth behind fellow American Ryan Lochte, Thiago Pereira of Brazil, and Kosuke Hagino of Japan in the 400-meter individual medley. It was the first time Phelps failed to medal in an Olympic event since 2000. The next night, in his second event of the Games, he got a silver as a member of the 4×100-meter free relay. Phelps swam the fastest leg of the US relay team and the second-fastest of anyone in the race. On July 31, 2012, Phelps won a silver medal in the 200-meter butterfly behind South African Chad le Clos by only 5/100ths of a second, and a gold medal in the 4×200-meter freestyle relay, thereby equaling and then surpassing Larisa Latynina to become the all-time record holder for most Olympic medals won. Latynina was present at the race and asked to be the presenter of Phelps's medal, but was told that Olympic rules would not allow it. She called Phelps deserving of the record. On August 2, 2012, Phelps won his 16th Olympic Gold Medal when he edged out Ryan Lochte to win the 200-meter individual medley with a time of 1:54.27, and by that victory also became the first male swimmer to win the same event in three consecutive Olympics. Rebecca Soni and Phelps (twice) are the only swimmers to successfully defend an individual title from the 2008 Games. This win also marked Phelps's fifth Olympic title in the individual medley, breaking the record of four shared by Hungarian Tamás Darnyi and Ukrainian Yana Klochkova. He repeated the achievement of winning the same event at three Olympics the following evening, winning the Olympic gold medal in the 100 m butterfly, his last individual event. After two very close victories in the 100 m butterfly at the 2004 and 2008 Olympics (by 0.04 and 0.01 sec, respectively), in this race Phelps beat Le Clos and Yevgeny Korotyshkin, who tied for silver, by 0.23 sec. Phelps's final event was the 4×100-meter medley relay in which he went on to win his 18th career gold medal and his 22nd overall. By winning 4 gold and 2 silver medals, Phelps concluded the 2012 Olympics as the most successful swimmer of the meet for the third Olympics in a row. After his last event, the international swimming federation FINA honored Phelps with an award commemorating his standing as the most decorated Olympian ever. In April 2014, Phelps announced he would come out of retirement, and would enter an event later that month. In May 2014, he won the 100-meter butterfly event at the Arena Grand Prix in Charlotte, North Carolina. After having been dropped from the team for the 2015 World Aquatics Championships for his DUI, Phelps competed in the US National Championships in San Antonio instead as his target meet of the summer. He won gold medals in the 100 meter butterfly (50.45), 200 meter butterfly (1:52.94), and the 200 meter individual medley (1:54.75). In each of these events he swam the fastest time of the year so far. During the 2008 Olympics, Phelps was questioned by the press as to whether perhaps his feats were "too good to be true", a reference to unsupported rumors that Phelps might be taking performance-enhancing drugs. In response, Phelps noted that he had signed up for Project Believe, a project by the United States Anti-Doping Agency in which U.S. Olympians can volunteer to be tested in excess of the World Anti-Doping Agency guidelines. During the Games, Phelps passed all nine tests that were administered to him. Phelps has trained under Bob Bowman since he was 11 years old. Bowman swam for Florida State University from 1983 to 1985. Phelps has said Bowman reminded him of a drill sergeant because of his disciplined and regimented ways. However, Phelps has said, "Training with Bob is the smartest thing I've ever done ... I'm not going to swim for anyone else." After the 2004 Summer Olympics, Bowman was hired as the head coach for the University of Michigan after Jon Urbanchek retired. Phelps joined Bowman at Michigan to train and attended classes, but did not pursue a degree. Phelps served as a volunteer assistant coach at Michigan. After the 2008 Summer Olympics, Bowman returned to Baltimore as CEO at the North Baltimore Aquatic Club. Phelps also returned to Baltimore with Bowman. Michael Phelps at Santa Clara, California, 2009. Bob Bowman described Phelps as "a solitary man" with a "rigid focus" at the pool prior to a race, but afterwards "a man incredibly invested in the success of the people he cares about". "He's unbelievably kind-hearted", recounting Phelps's interaction with young children after practices. In February 2015, Phelps announced he was engaged to Nicole Johnson. In November 2004, at the age of 19, Phelps was arrested for driving under the influence of alcohol in Salisbury, Maryland. He pleaded guilty to driving while impaired, and was sentenced to serve 18 months' probation, fined $250, ordered to speak to high school students about drinking and driving and to attend a Mothers Against Drunk Driving (MADD) meeting. Asked about the incident later by Matt Lauer on the Today Show, Phelps said that he had "let a lot of people in the country down." In February 2009, publication of a photograph of Phelps using a water pipe, a device used for smoking tobacco or marijuana, resulted in the loss of the Kellogg Company as a sponsor, as well as a three-month suspension by USA Swimming. Phelps admitted that the photo, taken at a party at the University of South Carolina, was authentic. He publicly apologized, saying his behavior was "inappropriate". In September 2014, he was arrested again, on driving under the influence of alcohol and speeding charges in Baltimore, Maryland. As a result, USA Swimming suspended him from all competitions for six months, and stated he would not be chosen to represent the United States at the 2015 World Aquatics Championships in August. Phelps idolized Australian swimmer Ian Thorpe as a teenager, modelling his public image after him. Thorpe initially said it was highly unlikely for Phelps to win eight gold medals at the 2008 Summer Olympics in Beijing. Phelps used the remarks as motivation, taping them to his locker during the Games. Thorpe was in the stands for the 4×100-meter medley relay, where Phelps was swimming for his eighth Olympic title. When Phelps and his teammates captured the gold, Thorpe gave a congratulatory kiss to Phelps's mother, then gave a handshake and a hug to congratulate Phelps. Thorpe afterwards said "I'm really proud of him not just because he won eight golds. Rather, it's how much he has grown up and matured into a great human being. Never in my life have I been so happy to have been proved wrong." After the 2008 Olympics, Phelps used his $1 million Speedo bonus to set up the Michael Phelps Foundation. His foundation focuses on growing the sport of swimming and promoting healthier lifestyles. In 2010, the Michael Phelps Foundation, the Michael Phelps Swim School and Boys & Girls Club members. The im program teaches children the importance of being active and healthy, with a focus on the sport of swimming. It also promotes the value of planning and goal-setting. im is offered through the Boys & Girls Clubs of America and through Special Olympics International. The Foundation has since developed two other programs, Level Field Fund-Swimming and Caps-for-a-Cause. The Foundation's largest event is its annual fundraiser, the Michael Phelps Foundation Golf Classic. Phelps stated he hopes to work with Foundation more after he retires from competition following the 2012 Summer Olympics in London. Phelps and Maryland House Speaker Mike Busch in April 2009. Both houses of the Maryland General Assembly honored Phelps that day. Phelps was a USA Olympic team member in 2000, 2004, 2008 and 2012, and holds the records for most Olympic gold medals (18), most such medals in individual events (11), and most such medals at a single games (8, in Beijing 2008). A street in his hometown of Baltimore was renamed The Michael Phelps Way in 2004. 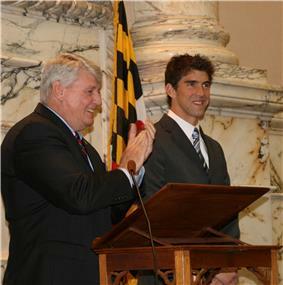 On April 9, 2009, Phelps was invited to appear before the Maryland House of Delegates and the Maryland Senate, to be honored for his Olympic accomplishments. With 39 world records (29 individual, 10 relay), Phelps set more records than any other swimmer, surpassing Mark Spitz's previous record of 33 world records (26 individual, 7 relay). All but two of the records were set in a long-course (50-meter) pool; records that currently stand are indicated in bold. Currently, he holds seven world records, not including his records for most Olympic medals and most Olympic gold medals ever won by one person. ^ "Michael Phelps". TVGuide.com. Retrieved July 28, 2012. ^ Harris, Nick (August 11, 2008). Baltimore Bullet' has history in his sights"'". The Independent (London). Archived from the original on August 25, 2010. Retrieved August 25, 2010. ^ Flying Fish' Phelps largely unknown in China"'". MSNBC. August 17, 2008. Retrieved April 21, 2012. ^ a b c d e f "USA Swimming bio: Michael Phelps". USA Swimming. Retrieved August 25, 2010. ^ "Overview Michael Phelps". London2012.com. Retrieved August 1, 2012. ^ "Franklin Pips Phelps For Top Honour". Retrieved October 7, 2014. ^ a b c d e "Phelps' voyage". The Baltimore Sun. August 3, 2008. Archived from the original on September 5, 2010. Retrieved September 5, 2010. ^ Jon Rapoport (2012-08-03). "Michael Phelps' Baltimore Life, In & Out Of The Pool (Photos)". ifollosports. Retrieved 2014-08-01. ^ a b Phelps, Beneath the Surface, p. 15. ^ a b Hiaasen, Rob (January 14, 2001). "Life in the Fast Lane". ^ "michael phelps". Freepages.genealogy.rootsweb.ancestry.com. Retrieved August 1, 2012. ^ Klingaman, Mike (May 31, 2007). "Towson High proud to have its own star in Phelps". Baltimore Sun. Retrieved July 28, 2012. ^ Phelps, Beneath the Surface, p. 16. ^ Phelps, Beneath the Surface, p. 24. ^ Phelps, Beneath the Surface, p. 85. ^ Phelps, Beneath the Surface, p. 78. ^ Phelps, Beneath the Surface, p. 88. ^ Phelps, Beneath the Surface, p. 92. ^ Phelps, Beneath the Surface, p. 109. ^ a b Phelps, Beneath the Surface, p. 122. ^ Phelps, Beneath the Surface, p. 123. ^ Phelps, Beneath the Surface, p. 134. ^ Phelps, Beneath the Surface, p. 133. ^ "Phelps breaks fifth record at aquatic worlds". Canadian Broadcasting Corporation. July 28, 2003. Retrieved September 6, 2009. ^ "2003 World Championships – Men's 200 m butterfly results (semifinal)" (PDF). Omega Timing. Retrieved June 12, 2010. ^ "2003 World Championships – Men's 200 m butterfly results (final)" (PDF). Omega Timing. Retrieved June 12, 2010. ^ "2003 World Championships – Men's 4×200 m freestyle relay results (final)" (PDF). Omega Timing. Retrieved June 12, 2010. ^ "2003 World Championships – Men's 200 m individual medley results (semifinal)" (PDF). Omega Timing. Retrieved June 12, 2010. ^ "2003 World Championships – Men's 200 m individual medley results (final)" (PDF). Omega Timing. Retrieved June 12, 2010. ^ "2003 World Championships – Men's 100 m butterfly results (semifinal)" (PDF). Omega Timing. Retrieved June 12, 2010. ^ "2003 World Championships – Men's 100 m butterfly results (final)" (PDF). Omega Timing. Retrieved June 12, 2010. ^ "2003 World Championships – Men's 400 m individual medley results (final)" (PDF). Omega Timing. Retrieved June 12, 2010. ^ "2003 World Championships – Men's 4×100 m medley relay results (final)" (PDF). Omega Timing. Retrieved June 12, 2010. ^ "2003 World Championships – Men's 4×100 m medley relay results (heats)" (PDF). Omega Timing. Retrieved June 12, 2010. ^ Phelps, Beneath the Surface, p. 179. ^ "2004 U.S. Olympic Team Trials – Men's 400 m individual medley results (final)" (PDF). Omega Timing. Retrieved June 12, 2010. ^ "2004 U.S. Olympic Team Trials – Men's 200 m freestyle results (final)" (PDF). Omega Timing. Retrieved June 12, 2010. ^ Phelps, Beneath the Surface, p. 181. ^ "2004 U.S. Olympic Team Trials – Men's 200 m butterfly results (final)" (PDF). Omega Timing. Retrieved June 12, 2010. ^ "2004 U.S. Olympic Team Trials – Men's 200 m backstroke results (final)" (PDF). Omega Timing. Retrieved June 12, 2010. ^ Phelps, Beneath the Surface, p. 184. ^ "2004 U.S. Olympic Team Trials – Men's 200 m individual medley results (final)" (PDF). Omega Timing. Retrieved June 12, 2010. ^ "2004 U.S. Olympic Team Trials – Men's 100 m butterfly results (final)" (PDF). Omega Timing. Retrieved June 12, 2010. ^ a b Phelps, Beneath the Surface, p. 186. ^ Phelps, Beneath the Surface, p. 191. ^ "Games of the XXVIIIth Olympiad – Men's 400 m individual medley results (final)" (PDF). Omega Timing. Retrieved June 12, 2010. ^ "Games of the XXVIIIth Olympiad – Men's 4×100 m freestyle relay results (final)" (PDF). Omega Timing. Retrieved June 12, 2010. ^ Phelps, Beneath the Surface, p. 202. ^ "Games of the XXVIIIth Olympiad – Men's 200 m freestyle results (final)" (PDF). Omega Timing. Retrieved June 12, 2010. ^ Phelps, Beneath the Surface, p. 204. ^ "Games of the XXVIIIth Olympiad – Men's 200 m butterfly results (final)" (PDF). Omega Timing. Retrieved June 12, 2010. ^ "Games of the XXVIIIth Olympiad – Men's 4×200 m freestyle relay results (final)" (PDF). Omega Timing. Retrieved June 12, 2010. ^ "Games of the XXVIIIth Olympiad – Men's 200 m individual medley results (final)" (PDF). Omega Timing. Retrieved June 12, 2010. ^ "Games of the XXVIIIth Olympiad – Men's 100 m butterfly results (final)" (PDF). Omega Timing. Retrieved June 12, 2010. ^ a b Schaller, p. 40. ^ a b Phelps, Beneath the Surface, p. 218. ^ "Games of the XXVIIIth Olympiad – Men's 4×100 m medley relay results (heats)" (PDF). Omega Timing. Retrieved June 12, 2010. ^ "Games of the XXVIIIth Olympiad – Men's 4×100 m medley relay results (final)" (PDF). Omega Timing. Retrieved June 12, 2010. ^ Phelps, Beneath the Surface, p. 243. ^ "2005 World Championship Trials – Men's 400 m freestyle results (final)" (PDF). Omega Timing. Retrieved June 12, 2010. ^ "2005 World Championship Trials – Men's 200 m freestyle results (final)" (PDF). Omega Timing. Retrieved June 12, 2010. ^ "2005 World Championship Trials – Men's 100 m butterfly results (final)" (PDF). Omega Timing. Retrieved June 12, 2010. ^ "2005 World Championship Trials – Men's 100 m freestyle results (final)" (PDF). Omega Timing. Retrieved June 12, 2010. ^ "2005 World Championship Trials – Men's 200 m individual medley results (final)" (PDF). Omega Timing. Retrieved June 12, 2010. ^ "2005 World Championships – Men's 400 m freestyle results (heats)" (PDF). Omega Timing. Retrieved June 12, 2010. ^ "2005 World Championships – Men's 4×100 m freestyle relay results (heats)" (PDF). Omega Timing. Retrieved June 12, 2010. ^ "2005 World Championships – Men's 200 m freestyle results (final)" (PDF). Omega Timing. Retrieved June 12, 2010. ^ "2005 World Championships – Men's 100 m freestyle results (final)" (PDF). Omega Timing. Retrieved June 12, 2010. ^ "2005 World Championships – Men's 200 m individual medley results (final)" (PDF). Omega Timing. Retrieved June 12, 2010. ^ "2005 World Championships – Men's 4×200 m freestyle relay results (final)" (PDF). Omega Timing. Retrieved June 12, 2010. ^ "2005 World Championships – Men's 100 m butterfly results (final)" (PDF). Omega Timing. Retrieved June 12, 2010. 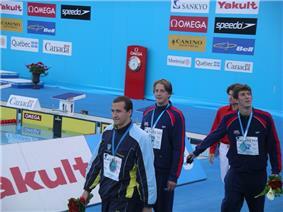 ^ "2005 World Championships – Men's 4×100 m medley relay results (final)" (PDF). Omega Timing. Retrieved June 12, 2010. ^ "2005 World Championships – Men's 4×100 m medley relay results (heats)" (PDF). Omega Timing. Retrieved June 12, 2010. ^ Phelps, Beneath the Surface, p. 261. ^ "2006 ConocoPhillips National Championships – Men's 200 m butterfly results (final)" (PDF). Omega Timing. Retrieved June 12, 2010. ^ "2006 ConocoPhillips National Championships – Men's 100 m butterfly results (final)" (PDF). Omega Timing. Retrieved June 12, 2010. ^ "2006 ConocoPhillips National Championships – Men's 200 m individual medley results (final)" (PDF). Omega Timing. Retrieved June 12, 2010. ^ Phelps, Beneath the Surface, p. 264. ^ "2006 Pan Pacific Swimming Championships – Men's 200 m butterfly results (final)" (PDF). Omega Timing. Retrieved June 12, 2010. ^ "2006 Pan Pacific Swimming Championships – Men's 400 m individual medley results (final)" (PDF). Retrieved June 12, 2010. ^ "2006 Pan Pacific Swimming Championships – Men's 4×200 m freestyle relay results (final)" (PDF). Omega Timing. Retrieved June 12, 2010. ^ "2006 Pan Pacific Swimming Championships – Men's 200 m backstroke results (final)" (PDF). Omega Timing. Retrieved June 12, 2010. ^ "2006 Pan Pacific Swimming Championships – Men's 4×100 m freestyle relay results (final)" (PDF). Omega Timing. Retrieved June 12, 2010. ^ "2006 Pan Pacific Swimming Championships – Men's 200 m individual medley results (final)" (PDF). Omega Timing. Retrieved June 12, 2010. ^ "12th FINA World Championships – Men's 4×100 m freestyle relay results (final)" (PDF). Omega Timing. Retrieved June 13, 2010. ^ "12th FINA World Championships – Men's 200 m freestyle results (final)" (PDF). Omega Timing. Retrieved June 13, 2010. ^ "12th FINA World Championships – Men's 200 m butterfly results (final)" (PDF). Omega Timing. Retrieved June 13, 2010. ^ "12th FINA World Championships – Men's 200 m individual medley results (final)" (PDF). Omega Timing. Retrieved June 13, 2010. ^ "12th FINA World Championships – Men's 4×200 m freestyle relay results (final)" (PDF). Omega Timing. Retrieved June 13, 2010. ^ "12th FINA World Championships – Men's 100 m butterfly results (final)" (PDF). Retrieved June 13, 2010. ^ "12th FINA World Championships – Men's 400 m individual medley results (final)" (PDF). Omega Timing. Retrieved June 13, 2010. ^ "12th FINA World Championships – 4×100 m medley relay results (heats)" (PDF). Omega Timing. Retrieved June 13, 2010. ^ "Phelps Fells Lochte Over 200m Back". Retrieved October 7, 2014. ^ "Phelps grabs two titles in an hour". Retrieved October 7, 2014. ^ "2008 U.S. Olympic Team Trials – 400 m individual medley results (final)" (PDF). Omega Timing. Retrieved June 13, 2010. ^ "2008 U.S. Olympic Team Trials – 200 m freestyle results (final)" (PDF). Omega Timing. Retrieved June 13, 2010. ^ "2008 U.S. Olympic Team Trials – 100 m freestyle results (heats)" (PDF). Omega Timing. Retrieved June 13, 2010. ^ "2008 U.S. Olympic Team Trials – 200 m butterfly results (final)" (PDF). Omega Timing. Retrieved June 13, 2010. ^ "2008 U.S. Olympic Team Trials – 200 m individual medley results (final)" (PDF). Omega Timing. Retrieved June 13, 2010. ^ "2008 U.S. Olympic Team Trials – 100 m butterfly results (final)" (PDF). Omega Timing. Retrieved June 13, 2010. ^ Phelps, No Limits, p. 45. ^ Phelps, No Limits, p. 52. ^ Phelps, No Limits, p. 97. ^ Phelps, No Limits, p. 129. ^ Phelps, No Limits, p. 130. ^ Phelps, No Limits, p. 151. ^ Phelps, No Limits, p. 152. ^ Phelps, No Limits, p. 176. ^ Phelps, No Limits, p. 184. ^ Phelps, No Limits, p. 206. ^ Phelps, No Limits, p. 207. ^ Longman, Jeré (August 20, 2008). "By Withholding Photos, Olympic Timekeeper Draws Attention to Relationship With Phelps". The New York Times. Retrieved June 13, 2010. ^ Clarey, Christopher (August 16, 2008). "Cavic Finds a Personal Triumph in the Narrowest of Defeats". The New York Times. Retrieved June 13, 2010. ^ a b "Michael Phelps was given an Olympic gold in a race he did not win, claims Mark Spitz". telegraph.co.uk. 20 April. ^ "Phenomenal Phelps wins 7th gold by 0.01 seconds to tie Spitz". ^ a b Phelps, No Limits, p. 218. ^ "Phelps claims Olympic-record eighth gold medal with relay win". Sports Illustrated. August 17, 2008. Archived from the original on August 25, 2010. Retrieved August 25, 2010. ^ "Phelps wins historic eighth gold medal". CNN. August 17, 2008. Archived from the original on August 25, 2010. Retrieved August 25, 2010. ^ "2009 National Championships – 200 m freestyle results (final)" (PDF). Omega Timing. Retrieved June 13, 2010. ^ "2009 National Championships – 200 m butterfly results (final)" (PDF). Omega Timing. Retrieved June 13, 2010. ^ "2009 National Championships – 100 m butterfly results (final)" (PDF). Omega Timing. Retrieved June 13, 2010. ^ Karen Crouse (July 27, 2009). "World Records Fall in Swimming, and It's Only Day 1". The New York Times. Retrieved August 5, 2009. ^ "2009 World Championships – 200 m freestyle results (final)" (PDF). Omega Timing. Retrieved June 19, 2010. ^ "Coach threatens to pull Phelps". ESPN. Associated Press. July 28, 2009. Archived from the original on September 4, 2010. Retrieved September 4, 2010. ^ "Phelps bounces back from loss with record in 200-meter butterfly". Sports Illustrated. July 29, 2009. Archived from the original on August 25, 2010. Retrieved August 25, 2010. ^ Matt Daily and Braden Reddall (July 31, 2009). "U.S. seals men's 4x200 relay title in record time". The US Daily. Retrieved August 5, 2009. ^ "Phelps refrains from adding to the fire". (Reuters). Television New Zealand. July 31, 2009. Archived from the original on September 4, 2010. Retrieved September 4, 2010. ^ "Cavic: I'll buy Phelps new suit". ESPN. July 31, 2009. Retrieved June 22, 2010. ^ John Kenny (August 3, 2009). "Phelps goes under 50 seconds in 100m butterfly". The Irish Times. Retrieved August 5, 2009. ^ Rebecca Bryan (August 2, 2009). "Phelps savours triumph over rival Cavic". The Sydney Morning Herald. Retrieved June 22, 2010. ^ Karen Crouse (August 2, 2009). "Phelps Leaves Rome With Another Gold". The New York Times. Retrieved August 5, 2009. 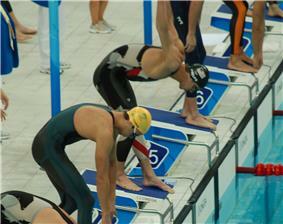 ^ "2010 ConocoPhillips National Championships – 200 m freestyle results (final)" (PDF). Omega Timing. Retrieved August 9, 2010. ^ "2010 ConocoPhillips National Championships – 200 m butterfly results (final)" (PDF). Omega Timing. Retrieved August 9, 2010. ^ "2010 ConocoPhillips National Championships – 100 m butterfly results (final)" (PDF). Omega Timing. Retrieved August 9, 2010. ^ "No surprises -Phelps takes gold". San Francisco Chronicle. Associated Press. August 6, 2010. Archived from the original on September 4, 2010. Retrieved September 4, 2010. ^ "Michael Phelps 'fairly pleased' after making history at US nationals". The Guardian (London). August 6, 2008. Archived from the original on September 4, 2010. Retrieved September 4, 2010. ^ "2010 ConocoPhillips National Championships – 200 m individual medley results (final)" (PDF). Omega Timing. Retrieved August 9, 2010. ^ Dillman, Lisa (August 6, 2010). "Ryan Lochte upsets Michael Phelps at national swimming championships". Los Angeles Times. Retrieved August 9, 2010. ^ "2010 ConocoPhillips National Championships – 200 m backstroke results (final)" (PDF). Omega Timing. Retrieved August 9, 2010. ^ "2010 Pan Pacific Swimming Championships – 200 m butterfly results (final)" (PDF). Omega Timing. Retrieved August 18, 2010. ^ "Phelps extends dominance in 200 fly at Pan Pacs". Associated Press. August 18, 2010. Archived from the original on August 18, 2010. Retrieved August 18, 2010. ^ "2010 Pan Pacific Swimming Championships – 400 m individual medley results (heats)" (PDF). Omega Timing. Retrieved August 19, 2010. ^ "2010 Pan Pacific Swimming Championships – 4×200 m freestyle relay results (final)" (PDF). Omega Timing. Retrieved August 19, 2010. ^ "2010 Pan Pacific Swimming Championships – 100 m butterfly results (final)" (PDF). Omega Timing. Retrieved August 20, 2010. ^ "2010 Pan Pacific Swimming Championships – 4×100 m freestyle relay results (final)" (PDF). Omega Timing. Retrieved August 20, 2010. ^ "2010 Pan Pacific Swimming Championships – 4×100 m medley relay results (final)" (PDF). Omega Timing. Retrieved August 21, 2010. ^ "FINA World Championships, Swimming: Australia Stuns France, U.S. For Men's 400 Free Relay Triumph; Two New Textile Bests". Swimming World Magazine. July 24, 2011. Retrieved July 27, 2011. ^ "FINA World Championships, Swimming: Ryan Lochte Bests Michael Phelps For 200 Free Gold". Swimming World Magazine. July 26, 2011. Retrieved July 27, 2011. ^ "FINA World Championships, Swimming: Michael Phelps Closes Out Takeshi Matsuda for Gold Medal". Swimming World Magazine. July 27, 2011. Retrieved July 27, 2011. ^ "FINA World Championships, Swimming: Ryan Lochte Sets First Post Techsuit-Era World Record". Swimming World Magazine. July 28, 2011. Retrieved July 28, 2011. ^ "FINA World Championships, Swimming: Ryan Lochte's Monster Anchor Leg Secures United States Victory in 800 Free Relay". Swimming World Magazine. July 29, 2011. Retrieved July 29, 2011. ^ "FINA World Championships, Swimming: Michael Phelps Threepeats 100 Fly". Swimming World Magazine. July 30, 2011. Retrieved July 30, 2011. ^ "FINA World Championships, Swimming: United States Edges Australia for 400 Medley Relay Win". Swimming World Magazine. July 31, 2011. Retrieved July 31, 2011. ^ PAUL NEWBERRY (AP National Writer) (July 2, 2012). "Phelps locks up another 8-race program in London – Yahoo! Sports". Sports.yahoo.com. Retrieved August 1, 2012. ^ Powers, John. "Michael Phelps earns expected Olympic berth". The Boston Globe. Retrieved June 26, 2012. ^ "Ryan Lochte wins medley gold as Michael Phelps finishes fourth". July 29, 2012. ^ Layden, Tim (July 29, 2012). "Phelps, U.S. fail to recreate Beijing magic, drop to silver in 400 relay". Sports Illustrated. Retrieved July 29, 2012. ^ Fab Five' brings home gymnastics gold"'". CNN. August 1, 2012. Retrieved August 1, 2012. ^ Gibson, Owen (August 1, 2012). "Michael Phelps breaks record by reaching 19 Olympic medals in London". The Guardian. Retrieved August 1, 2012. ^ Longman, Jeré (July 31, 2012). "Phelps Tops Another Olympian, but at 77, She Grins". The New York Times. p. A1. Retrieved August 1, 2012. ^ "Michael Phelps wins 16th career gold". ESPN. August 3, 2012. Retrieved August 3, 2012. ^ Crouse, Karen (August 2, 2012). "Soni Sets World Record to Win 200 Breaststroke". The New York Times. p. A1. Retrieved August 4, 2012. ^ Zaccardi, Nick (August 3, 2012). "Phelps surges toward exit as Franklin, Ledeckey rise to stardom". London 2012 (cnnsi.com). Retrieved August 3, 2012. ^ "2012 London Olympics: Michael Phelps Leads All Swimmers With Six Medals". Swimming World Magazine. August 5, 2012. Retrieved August 4, 2012. ^ a b Almond, Elliott (August 3, 2012). "Olympics: Michael Phelps shows once more why he's the gold standard in swimming". Mercury News. Retrieved August 4, 2012. ^ Goldberg, Rob (May 16, 2014). "Michael Phelps at Charlotte Grand Prix 2014: Race Results and Twitter Reaction". ^ "Men's 100 meter butterfly Final". Omega Timing. August 8, 2015. ^ "Men's 200 meter butterfly Final". Omega Timing. August 7, 2015. ^ "Men's 200 meter Individual Medley Final". Omega Timing. August 9, 2015. ^ Phelps, No Limits, p. 185. ^ "I'm clean , says history making Phelps". Daily News and Analysis (India). August 15, 2008. Retrieved June 21, 2010. ^ Craig Lord (July 2, 2008). "Michael Phelps shrugs off question of drugs". The Sunday Times (London). Retrieved June 21, 2010. ^ Allan Maki (August 15, 2008). "Phelps deals with doping questions". Globe and Mail (Canada). Retrieved June 21, 2010. ^ Gina Kolata (August 15, 2008). "So Far, Drug Testing Has Revealed Only a Few Positives". The New York Times. Retrieved June 21, 2010. ^ Kevin Van Valkenburg (August 16, 2008). "Opposites attract". The Baltimore Sun. Retrieved July 3, 2010. ^ "University of Michigan Official Athletic Site – Olympics". Mgoblue.Com. July 26, 2012. Retrieved August 1, 2012. ^ a b "Profile: Michael Phelps". The Sunday Times (London). August 17, 2008. Archived from the original on September 7, 2010. Retrieved September 7, 2010. ^ "Michael Phelps Just Got Engaged to Former Miss California USA". Time. February 22, 2015. Retrieved February 22, 2015. ^ "Olympic Champ Sentenced For DUI". CBS News. December 29, 2004. Retrieved February 14, 2008. ^ Juliet Macur (February 5, 2009). "Phelps Disciplined Over Marijuana Pipe Incident". The New York Times. Retrieved February 5, 2009. ^ Phelps dodges jail in drunk driving case, AFP, December 20, 2014. ^ Olympian Michael Phelps apologizes for DUI arrest, Associated Press, September 30, 2014. ^ "Michael Phelps suspended from swimming for six months". BBC News. 6 October 2014. Retrieved 6 October 2014. ^ Phelps, Beneath the Surface, p. 95. ^ Nicole Jeffery (July 23, 2008). "Thorpe's doubt of eight gold sweep spurs Phelps". The Australian. Retrieved June 21, 2010. ^ Phelps, Beneath the Surface, p. 281. ^ Kaz Mochlinski (August 20, 2008). "Ian Thorpe happy to have been proved wrong by Michael Phelps". The Daily Telegraph (London). Retrieved June 21, 2010. ^ Phelps, No Limits, p. 227. ^ Bob Considine (September 2, 2008). "Phelps to use $1 million bonus to start charity". TODAY People. Retrieved June 21, 2010. ^ Johnson, Drew. "Michael Phelps Launches Foundation, Donates Speedo $1 Million Bonus to Charity Olympic Gold Medalist Embarks on Eight-City Tour". Retrieved May 30, 2012. ^ Phelps, No Limits, p. 226. ^ a b Van Valkenburg, Kevin (June 24, 2011). "Phelps expands swimming education initiative". ^ Murphy, Mandy (August 1, 2010). "Michael Phelps Becomes Special Olympics' Newest Global Ambassador". Retrieved May 30, 2012. ^ Michael Phelps Foundation. "Programs". Michael Phelps Foundation. Retrieved May 30, 2012. ^ "Level Field Fund Establishes Level Field Fund – Swimming". August 16, 2010. Retrieved May 30, 2012. ^ Van Valkenburg, Kevin (September 14, 2010). "Tee times, not London, keeping Phelps busy". Baltimore Sun. Retrieved May 30, 2012. ^ Phelps, Michael. "Michael Phelps Foundation Golf Classic". Speedo Pace Club. Retrieved May 30, 2012. ^ Schultz, Jordan (May 11, 2012). "Michael Phelps On London 2012 Olympics, His New Post-Swimming Diet And Retirement Plans". Huffington Post. Retrieved May 30, 2012. ^ "Athlete Bio: Michael Phelps". The New York Times. July 26, 2008. Archived from the original on September 5, 2010. Retrieved September 5, 2010. ^ "Phelps wins over General Assembly, hopes Preakness stays in Maryland". The Baltimore Sun. Retrieved April 11, 2009. ^ a b "Swimming World Magazine: Swimmers of the Year". Swimming World Magazine. December 1, 2009. Retrieved September 5, 2010. ^ "Swimming World Names 2009 American Swimmers of the Year". Swimming World Magazine. November 29, 2009. Archived from the original on September 5, 2010. Retrieved September 5, 2010. ^ "USOC Athletes of the Year". United States Olympic Committee. Retrieved September 5, 2010. ^ Freeman, Rick (April 13, 2004). "Phelps joins prestigious Sullivan list". USA Today. Associated Press. Archived from the original on September 5, 2010. Retrieved September 5, 2010. ^ "Nominees archive (2004)". Laureus.com. Retrieved September 5, 2010. ^ "Nominees archive (2005)". Laureus.com. Retrieved September 5, 2010. ^ "Nominees archive (2008)". Laureus.com. Retrieved September 5, 2010. ^ "Nominees archive (2009)". Laureus.com. Retrieved September 5, 2010. ^ "Michael Phelps Named Sports Illustrated Sportsman of the Year". Swimming World Magazine. December 2, 2008. Archived from the original on September 5, 2010. Retrieved September 5, 2010. ^ a b Litsky, Frank (November 30, 2001). "Youngster Quickly Joins Elite". The New York Times. Archived from the original on September 4, 2010. Retrieved September 4, 2010. ^ "World Record Not Quite Enough For Vendt In 400m IM". Usctrojans.com. August 15, 2002. Archived from the original on September 4, 2010. Retrieved September 4, 2010. ^ "U.S. Men Have Last Word, Set World Mark in 400m Medley Relay as Pan Pacs End With a Bang". Swimming World Magazine. August 29, 2002. Archived from the original on September 7, 2010. Retrieved September 7, 2010. ^ """Phelps Lowers His Own World Record in the 400 individual medley at "Duel in the Pool. Swimming World Magazine. April 6, 2003. Archived from the original on September 7, 2010. Retrieved September 7, 2010. ^ Ostler, Scott (June 30, 2003). "New world record? Phelps just starting". San Francisco Chronicle. Archived from the original on September 4, 2010. Retrieved September 4, 2010. ^ a b c d e "10th FINA World Championships, Barcelona (ESP): Full Results Book: Records Broken By Event" (PDF). Omega Timing. July 26, 2003. p. 167. Retrieved September 4, 2010. ^ "Phelps sets new world mark in 200m medley". Australian Broadcasting Corporation. August 10, 2003. Archived from the original on September 4, 2010. Retrieved September 4, 2010. ^ May, Meredith (July 8, 2004). "Setting the pace / Phelps breaks own world record in Olympic qualifying". San Francisco Chronicle. Archived from the original on September 4, 2010. Retrieved September 4, 2010. ^ "Phelps earns first gold". Casper Star-Tribune. August 15, 2004. Archived from the original on September 4, 2010. Retrieved September 4, 2010. ^ a b c "2006 Pan Pacific Swimming Championships, Victoria, British Columbia (CAN): Full Results Book: Records Broken By Event" (PDF). Omega Timing. August 20, 2006. p. 76. Retrieved September 4, 2010. 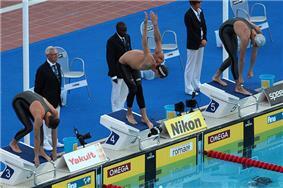 ^ "Phelps sets world record at Grand Prix". Columbia Missourian. February 18, 2007. Archived from the original on September 4, 2010. Retrieved September 4, 2010. ^ a b c d e "12th FINA World Championships, Melbourne (AUS): Full Results Book: Records Broken By Event" (PDF). Omega Timing. April 1, 2007. p. 190. Retrieved September 4, 2010. ^ a b "2008 U.S. Olympic Team Trials, Omaha (USA): Full Results Book: Records Broken By Event" (PDF). Omega Timing. July 6, 2008. p. 162. Retrieved September 4, 2010. ^ a b "Men's long course world records as of December 18, 2009" (PDF). Swimming World Magazine. December 18, 2009. Retrieved September 4, 2010. ^ "Phelps picks up third gold medal in Beijing". The Belfast Telegraph. August 12, 2008. Archived from the original on September 4, 2010. Retrieved September 4, 2010. ^ "More gold and another day at the office for Michael Phelps". Daily News (New York). August 12, 2008. Archived from the original on September 4, 2010. Retrieved September 4, 2010. ^ Stallman, Jason (August 12, 2008). "Phelps Adds 2 More Gold Medals". The New York Times. Archived from the original on September 4, 2010. Retrieved September 4, 2010. ^ Stallman, Jason (August 15, 2008). "Phelps wins 200 individual medley for sixth gold". The New York Times. Archived from the original on September 4, 2010. Retrieved September 4, 2010. ^ "Michael Phelps overtakes Mark Spitz with record-breaking haul of eight gold medals". The Sunday Telegraph (London). August 17, 2008. Archived from the original on September 4, 2010. Retrieved September 4, 2010. ^ "USA Swimming National Championships: Michael Phelps Demolishes World Record in 100 Fly". Swimming World Magazine. July 9, 2009. Archived from the original on September 4, 2010. Retrieved September 4, 2010. ^ a b c d "13th FINA World Championships, Rome (ITA): Full Results Book: Records Broken By Event" (PDF). Omega Timing. July 30, 2009. pp. 246–247. Retrieved September 4, 2010. ^ "British Gas Duel in the Pool – 4×100 m medley relay (final)" (PDF). Omega Timing. Retrieved October 25, 2010. ^ "British Gas Duel in the Pool: United States Team vs European Select Team: December 18–19 – 2009 Manchester (GBR): Full Results Book: Records Broken By Record Type" (PDF). Omega Timing. December 19, 2009. p. 32. Retrieved September 4, 2010. Phelps, Michael (2004). Beneath the Surface. United States: Sports Publishing LLC. Phelps, Michael (2008). No Limits: The Will to Succeed. United States: Free Press. Schaller, Bob (2008). Michael Phelps: The Untold Story of a Champion. United States: St. Martin's Griffin.